An inherent flaw with D&D 5e is that combat encounters favor the side with more actions per round. This makes planning epic boss encounters difficult to present a fair, but challenging fight for your players. A single boss creature has only 1 action per round while each player has at least 1 per turn. One way of solving this problem is to give your boss some minions during the fight to even the odds. Another way is to give your boss some legendary actions and lair actions. Legendary actions and lair actions are reserved for epic creatures or boss monsters, but they can be applied to any creature if you do a bit of homebrewing. These actions do basically what their name implies, give your creature a few extra actions per round of combat. This is to help combat some of the issues D&D 5e has with the action economy. Creatures can use legendary actions to give them more attacks and positioning choices per round. Creatures can only use lair actions when the encounter takes place in their lair or home territory. Let’s dive into each of these mechanics and learn how to use them. At the end of another creature’s turn, a creature can use a legendary action. A creature with legendary actions Each creature has separate actions it can choose from and each one costs a different amount of actions. Only one legendary action can be used at a time and the creature cannot use legendary actions while incapacitated. The creature regains its legendary actions at the start of its next turn. Creatures have a pool of legendary actions to use from each round of combat. Each legendary action can cost between 1-3 legendary actions per use depending on how powerful they are. Each action is a clearly-defined mechanic and cannot be substituted for something else. These actions could be movement, a defensive maneuver, casting a spell or cantrip, using one of the creature’s attacks or abilities, or a special ability only usable as a legendary action. There is no way for a creature to gain extra legendary actions. Once they have expended all of their actions the creature must wait for the start of their next turn to regain the use of the feature. If a creature is grappled, paralyzed, petrified, stunned, unconscious, or just plain incapacitated, they cannot use their legendary actions. The legendary creatures in the Monster Manual all have 3-4 unique legendary actions to choose from. However, per the rules, there is not a set limit to how many unique legendary actions a creature can choose from. Personally, I try to keep it between 3-5 different actions so that it’s simple for me to remember and use, but the sky’s the limit for homebrewing your own creatures and actions. The only rule you have to abide by for homebrewing is that each creature has a set number of legendary actions and that its unique actions should cost a number of actions depending on how powerful they are. There are quite a few creatures in the Monster Manual and other 5e supplements that have legendary actions. Liches are a great example for understanding legendary actions as they have an action for each unique cost. When creating homebrew legendary actions keep in mind how powerful each legendary action is when assigning a cost for it. The one action cost tier consists of actions that are weak attacks or can be used to reposition. Actions such as a weapon attack or a dash action are acceptable for this tier. One unique action I like to use is a dash that’s half the creature’s speed, but they don’t invoke opportunity attacks. The two action cost tier is home to the creature’s powerful unique attacks or abilities as well as CC abilities. Any attack that deals large amounts of damage and/or can potentially CC the target belongs here. Low to mid-level spells could also be placed in this tier depending on the creature’s spell list. Powerful, unique, AoE spells and abilities generally cost 3 legendary actions to use. These actions cause large-scale damage, crippling CC, or a bit of both. A single target ability could cost 3 legendary actions, but it would have to be an unbelievably powerful ability. As long as the action makes thematic sense for the creature to have you can slot it as a legendary action. Don’t be afraid to get creative and add a ton of flavor to your moves. These actions should be powerful and hard to predict. Your players should be forced to change-up their usual strategies when dealing with a legendary creature. Some legendary creatures and bosses have a special lair or home base. When the players encounter this enemy in their lair they are subject to special conditions called lair actions. At the top of the round, a creature can use one of its lair action options. They can only use one lair action per round. Compared to legendary actions, lair actions are simple to keep track of and use in combat. There are not any resources to keep track of and the only requirement is that the creatures must be within the lair for the actions to affect them. At the top of the round, you can choose which lair action to use if the creature would like to use one. Generally, the creature has between 2-4 lair actions to choose from at one time. A creature cannot use the same lair action twice in a row. This helps prevent you from choosing the “optimal” choice every single round and keeps the encounter fresh. 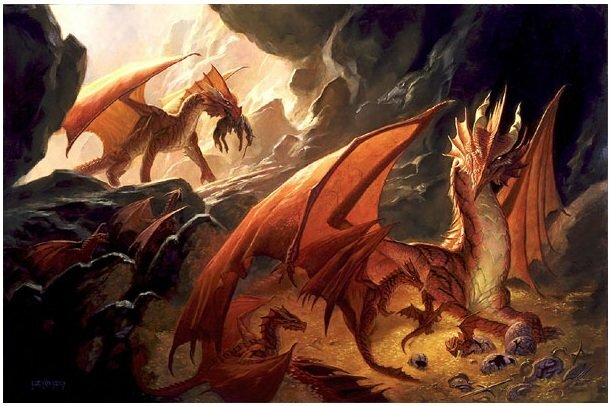 A red dragon’s lair is filled with treasure and in an area known for extreme heat. Credit: WotC. Lair actions should be used to raise the stakes of the encounter and help showcase some of the lair’s flavor and flair. These actions are usually extremely powerful. They can be the equivalent of high-level spells or 3 action legendary actions. Your players are in the creature’s home turf, they should try their hardest to avoid fighting a creature here. These lair actions should either give the creature an advantage in the fight or help to slow down or CC their enemies. For example, the gold dragon has both of these options in its two lair actions. The first lair action gives the creature advantage on all attack rolls, ability checks, and saving throws until its next turn. The second lair action is an AoE that has a chance to banish creatures to a different plane of existence. Lair actions can also cause damage depending on the lair’s environment. Lairs in biomes with extreme weather or climate can cause damage to the players that aren’t adjusted to the environment. Powerful spellcasters or creatures that setup traps could also have lairs that damage the invaders. Get creative and don’t be afraid to make some very powerful lair actions. Be sure to make each lair action have a different mechanic so the fight stays engaging. The lair and the surrounding environment can be changed either intentionally by the creature, or by the innate magical effects, the creature emanates. Regional effects end either right after the creature dies or will slowly lessen over time after the creature dies. Make up a short list of regional effects or use the ones in the creature’s respective supplement. Regional effects affect the area in and around the lair and tend to be non-threatening effects that provide flavor to the creature. Some effects can be used to the advantage of the creature or players, but most of the time they’re simply used to provide flavor and description for the upcoming encounter. Regional effects are different from lair actions as they do not require any use. You can choose all or none of the effects in the list depending on what you feel makes narrative sense to describe in the game. Be sure to include legendary actions when you are creating epic creatures or bosses for your games. These help to even the odds when these creatures are up against a party of 4-5 adventurers. Lair actions help to raise the stakes for the creature and give the party a reason to avoid fighting in its home territory. It also gives the creature a narrative reason to lure the party to them. Don’t be afraid to create your own lair actions and legendary actions for creatures in the official sources. These extra actions are a great way to inject your own flavor and make encounters more challenging for your party. As a reminder, legendary actions are completely separate from Legendary Resistance. This is another great tool for helping your epic creatures and bosses feel more powerful, but it is a separate resource from legendary actions. I’ve seen this trip up people new to homebrewing due to its naming convention.